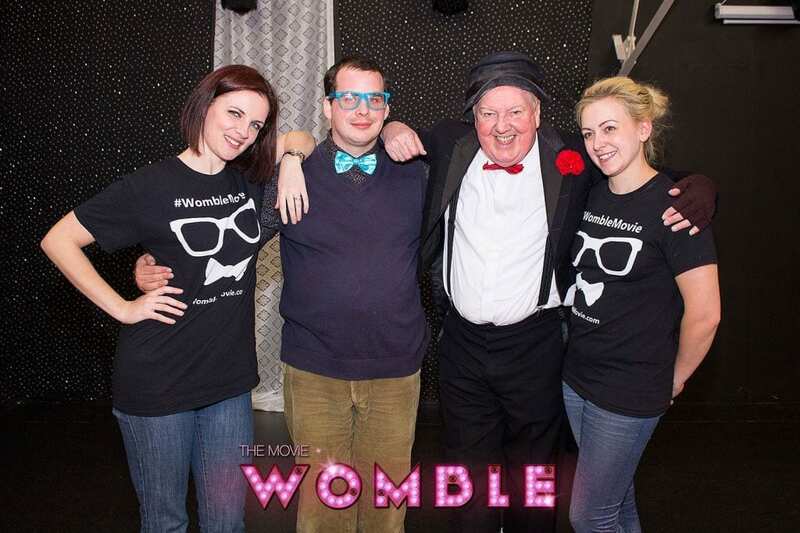 Tickets for the world premiere of Jimmy Cricket’s first play are selling fast. 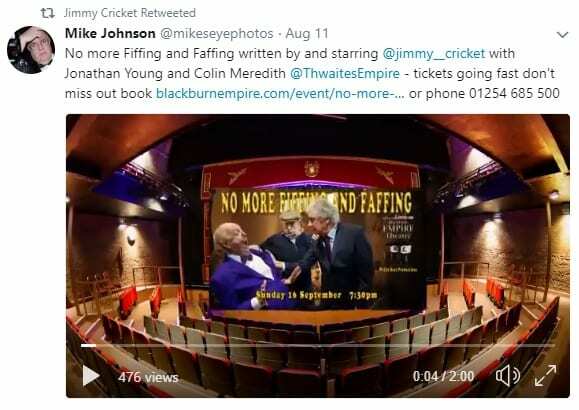 No more Fiffing and Faffing will be staged at the Blackburn Empire Theatre on Sunday 16 September at 7.30pm. Join comedy double act Joe Fiffen and Jerry Faffen on their last night in showbusiness. As well as their classic sketches, they’ll be settling some old scores in the dressing room. 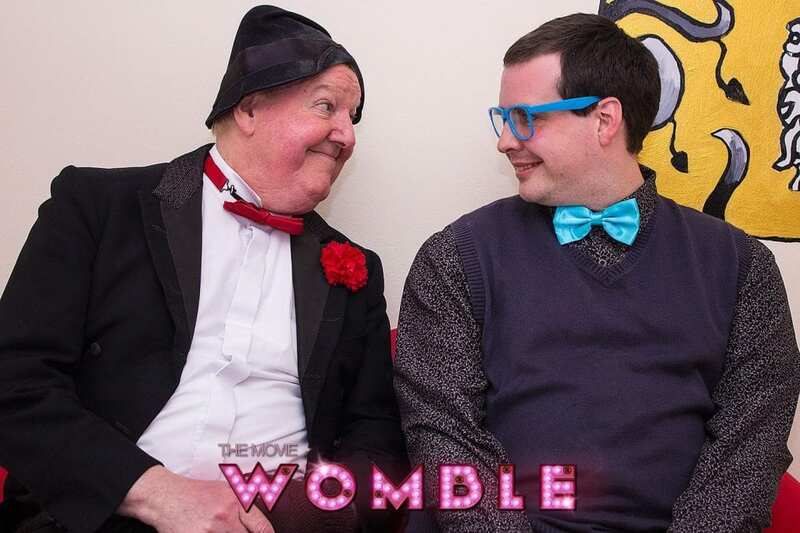 Appearing with famous comedian Jimmy will be Jonathan Young from The Bachelors, and actor Colin Meredith, who has had several notable appearances in ITV’s Coronation Street over the years. Read more about the play and book online here. Jimmy and his wife May have just returned from a European cruise. Northern Irish entertainer Jimmy was performing on the Magellan – a ship belonging to Cruise and Maritime Voyages – which sailed along the coasts of France, Portugal and Spain. Earlier on the cruise, they visited the cathedral at Santiago de Compostela, the resting place for the relics of the apostle St James and the finishing point for a popular pilgrimage route, the Camino de Santiago (the Way of St James). And later they went to the National Pantheon (Panteão Nacional) in Lisbon, in which important Portuguese personalities – including Eusébio – are buried. Eusébio da Silva Ferreira is considered by many as one of the greatest footballers of all time. Jimmy Cricket has visited the tomb of legendary Portuguese footballer Eusébio. The veteran comedian was at the National Pantheon (Panteão Nacional) in Lisbon, in which important Portuguese personalities – including Eusébio – are buried. 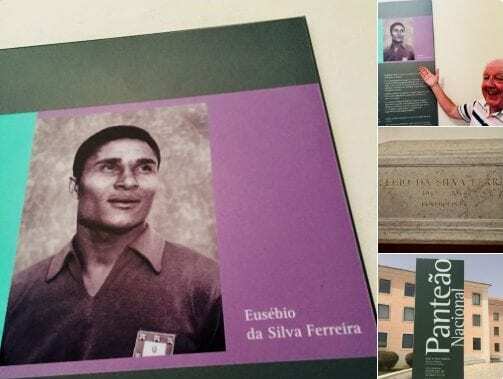 Eusébio da Silva Ferreira is considered by many as one of the greatest footballers of all time. He was known for his speed, technique, athleticism and his ferocious right-footed shot, making him a prolific goalscorer. During his professional career, he scored 733 goals in 745 matches (41 goals in 64 matches for Portugal). Eusébio helped Portugal to reach third place at the 1966 World Cup held in England, being the top goalscorer of the tournament with nine goals (including four in one match against North Korea). 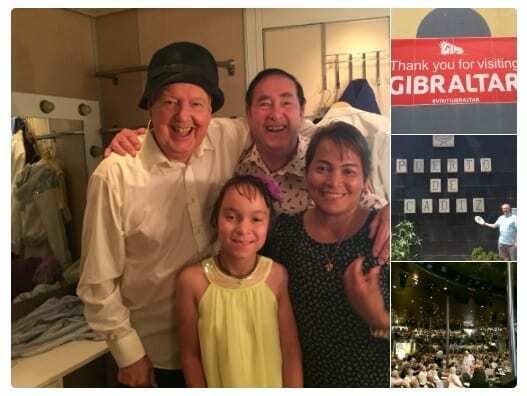 Famous Northern Irish entertainer Jimmy is currently working on a cruise ship, which is sailing along the coasts of France, Portugal and Spain. He and his wife May are on board the Magellan – a sailing vessel belonging to Cruise and Maritime Voyages. Earlier on the cruise, he visited the cathedral at Santiago de Compostela, the resting place for the relics of the apostle St James and the finishing point for a popular pilgrimage route, the Camino de Santiago (the Way of St James). Jimmy Cricket has paid a visit to a special cathedral during a day’s sight-seeing in north-west Spain. 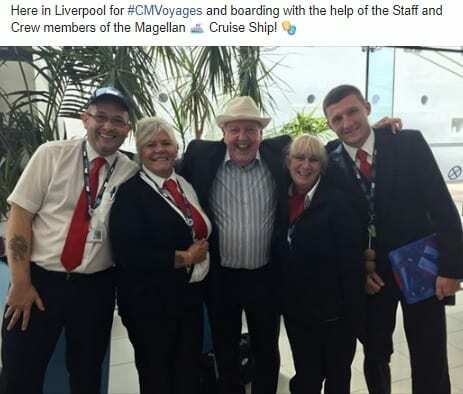 The well-known Northern Irish entertainer is currently working on a cruise ship which is sailing along the coasts of France, Portugal and Spain. 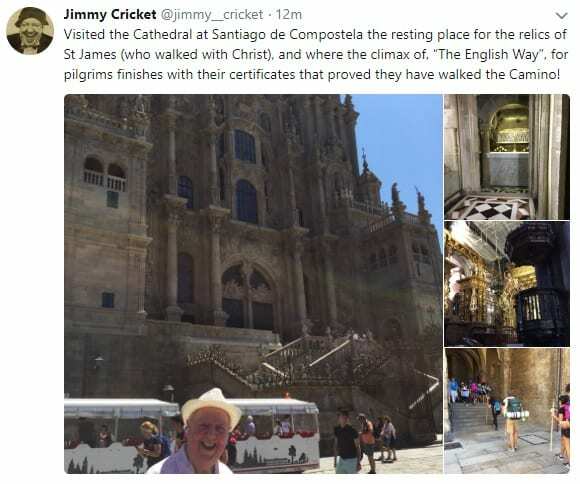 Jimmy posted on social media that he had visited the cathedral at Santiago de Compostela, the resting place for the relics of the apostle St James and the finishing point for a popular pilgrimage route, the Camino de Santiago (the Way of St James). The cathedral is part of the Roman Catholic Archdiocese of Santiago de Compostela and is an integral part of the world heritage site in Galicia. 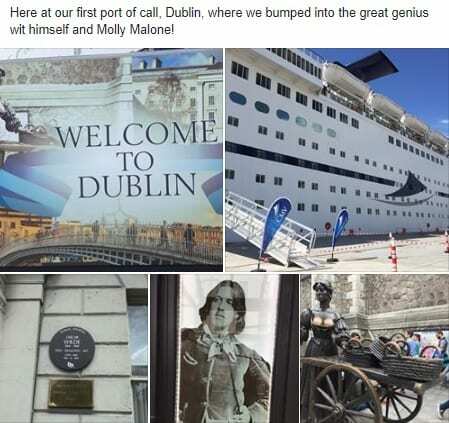 Dublin’s great genius wit himself… & Molly Malone! Famous funnyman Jimmy Cricket is currently working on a cruise ship which is sailing along the coasts of France, Portugal and Spain. Jimmy, 72 and his wife May are on board the Magellan – a ship belonging to Cruise and Maritime Voyages. It’s a boat he has performed on previously. Oscar Wilde, born in Dublin, was an Irish poet in the latter half of the 19th century and became one of London’s most popular playwrights at that time, being especially well-known for his witty portrayal of people and life in general. As a result of being on the cruise, Jimmy has postponed his next ‘Charity Jam Night’ at St Vincent’s Parish Centre in Rochdale by one week until Tuesday 14 August. 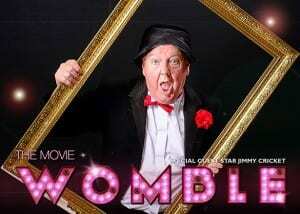 Jimmy Cricket’s exact role in a new feature film called Womble will not be revealed until it is actually screened. 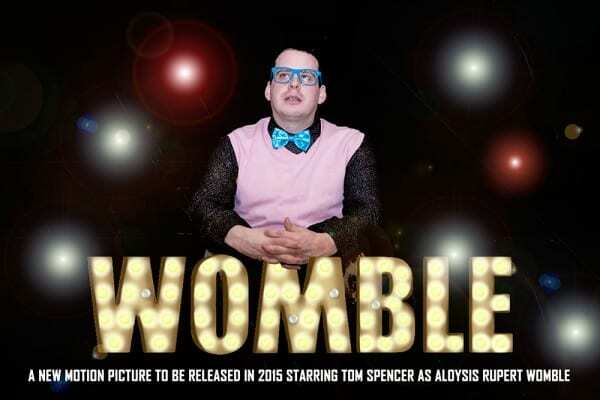 As reported on Cricket Times last month, Womble, one of the biggest independent movies to be made in North Wales, is being shot over the summer and will be set for release in 2016. 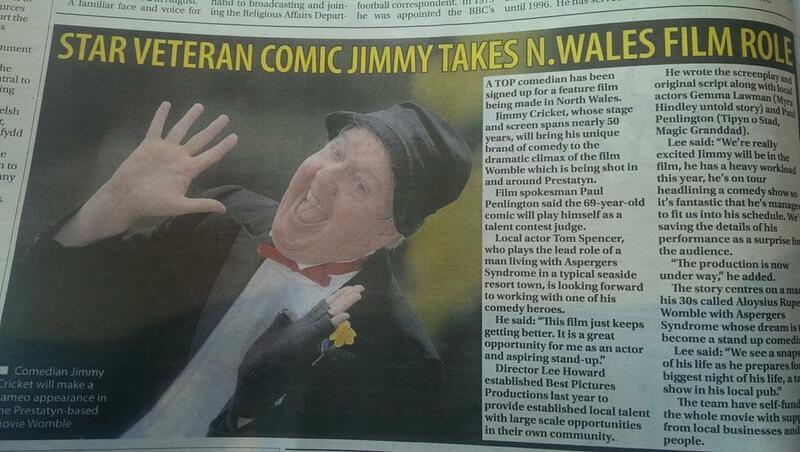 The 18 March edition of the North Wales Daily Post newspaper states that well-known entertainer Jimmy “will bring his unique brand of comedy to the climax of the film”, which is being set in and round Prestatyn. It reports that top comedian Jimmy, 69, will play himself as a talent contest judge. Movie director Lee Howard told the Post: “We’re excited Jimmy will be in the film… it’s fantastic that he’s managed to fit us into his schedule. Famous entertainer Jimmy Cricket is appearing as a guest star in a feature film. The film’s director is Lee Howard and it will be produced by his production company Best Pictures Productions. 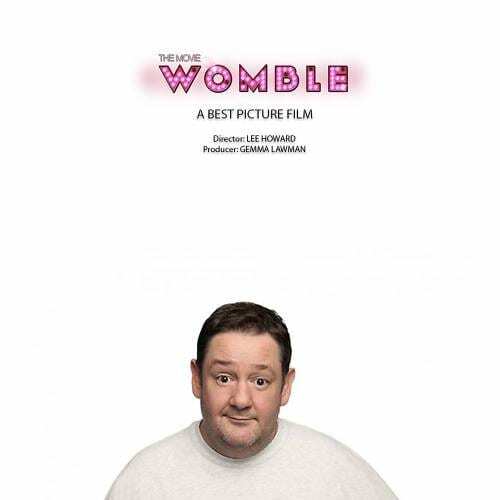 Lee wrote the screenplay and the original script for the film, along with local actors Gemma Lawman and Paul Penlington. The well-known Northern Irish comedian has appeared on most platforms within stage and screen over an illustrious and celebrated career. He added: “When I was approached by Lee at Best Pictures and he told me about the subject of the film, it sounded an interesting project to get involved with. 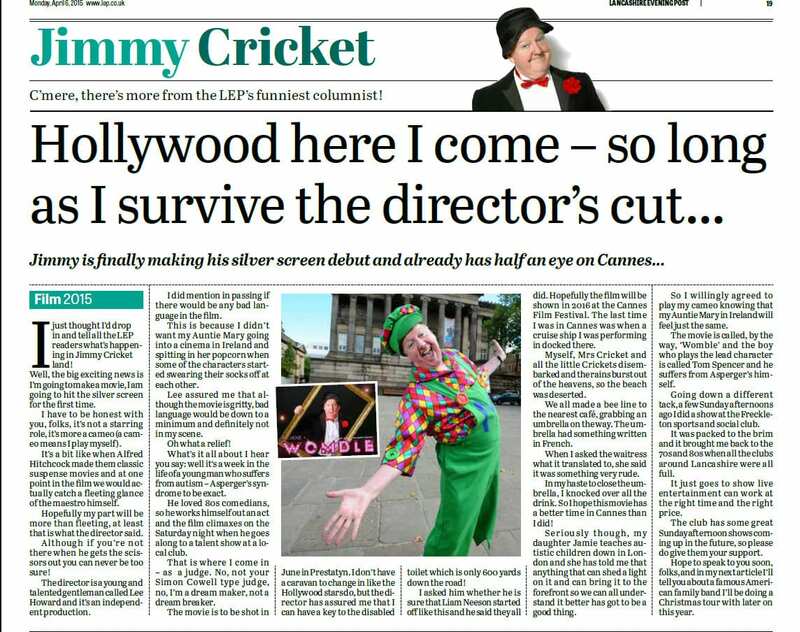 Jimmy Cricket felt like he had gone back in time when he performed at a Lancashire venue recently. 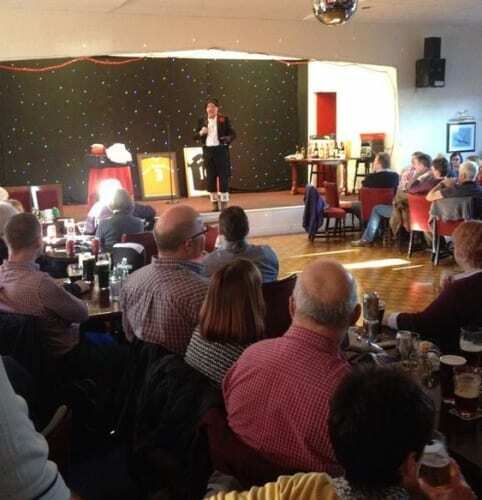 The St Pat’s event featured famous entertainer Jimmy alongside the comedian Tony Jo at the Freckleton Sports and Social Club, just outside the city of Preston. 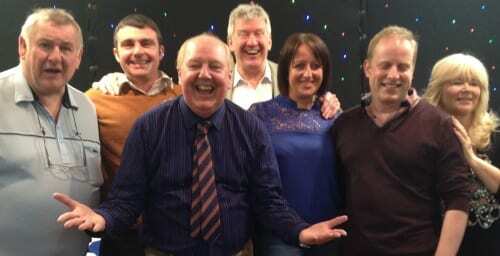 It was a fund-raiser to raise money for the cancer unit at the Victoria Hospital in Blackpool. The event, which was held on a Sunday afternoon, was packed to the rafters. Jimmy is performing more and more on a Sunday afternoon and is finding they are a popular time for people to attend a live event.